The Middleman enhances the guitars dominant energy. Conceived after a comprehensive research incorporating professional guitar players and sound technicians. Designed to be a versatile musical tool. Active Mid Boost, Clean Boost and Buffer in one pedal. Enhances the guitars natural tone. Ideal for pushing a tube amp into overdrive. Can make a Single coil pickup sound like a Hum-bucker. 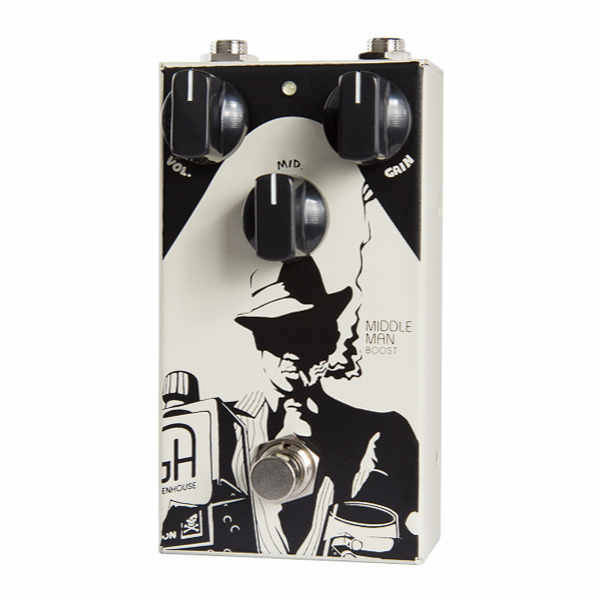 Greenhouse wanted a pedal that doesn’t boost frequencies that are not predominant to the guitar, that can also do a flat EQ clean boost and can add a tiny amount of distortion as well. The Mid knob sets the amount of boost or cut applied to the mid frequencies at 500Hz(up to 15Db). At 12 o’clock it is nonactive, and delivers a flat EQ response. The Gain knob boosts the level up to 35Db, adding a bit of grit as you crank it. The Volume knob is the master volume control of the Middleman. These simple three knob configuration gives you a substantial number of ways to boost and enhance your sound.